Lost your phone? Avast Anti-Theft helps get it back! Set up Avast Anti-Theft on your cell phone and if you lose it, you can track it and control it remotely. Our Avast mobile security developers labored over an ingenious feature that we hope you will never have to use. Losing your mobile phone may cause you to have a panic attack and cry uncontrollably, but if it happens to you, you can dry your tears because you have tools to find your phone when you install Avast Free Mobile Security with Anti-Theft. Avast Anti-Theft is a separate program included in Avast Free Mobile Security. You can install it at the same time as the Avast Mobile Security product, or later as a separate installation. Its unique capabilities help you recover your phone by controlling it remotely with SMS commands. Since Anti-Theft is a stand-alone application, once its launched, it hides itself, making it completely invisible to a potential thief. This “stealth mode” operation is an improvement on other products which keeps it visible. If a thief sees that an anti-theft application is installed on a phone, more than likely, they'll toss it in the nearest gutter, significantly reducing your chances of finding your phone. SIM card change notification – Thieves usually change the SIM card after stealing a phone. Anti-Theft recognizes when this happens and notifies you of the new number so you can maintain contact with your phone. Call/SMS forwarding – We took a page from the spy handbook with this feature! You can instruct your phone to call you back so you can silently listen in and obtain details of calls made and received as well as copies of text messages. Remote Siren – Scare the wits out of the thief by activating an extremely loud siren with an SMS command. We guarantee that everyone will hear it. GPS Location updates – Whether you dropped your phone somewhere, its riding on the bus by itself, or a thief is on the move, the GPS on your phone can be enabled so you can receive continuous GPS location updates. Self Protection – This feature makes it difficult for a thief to modify or uninstall anything on your phone. It can even survive a hard reset. Retrieve call logs, texts – Don't let passwords, emails, etc. get into the wrong hands. You can recover your personal data from your phone before wiping it clean. Thorough wipe – Once you have all your data, you can remotely wipe your phone clean. 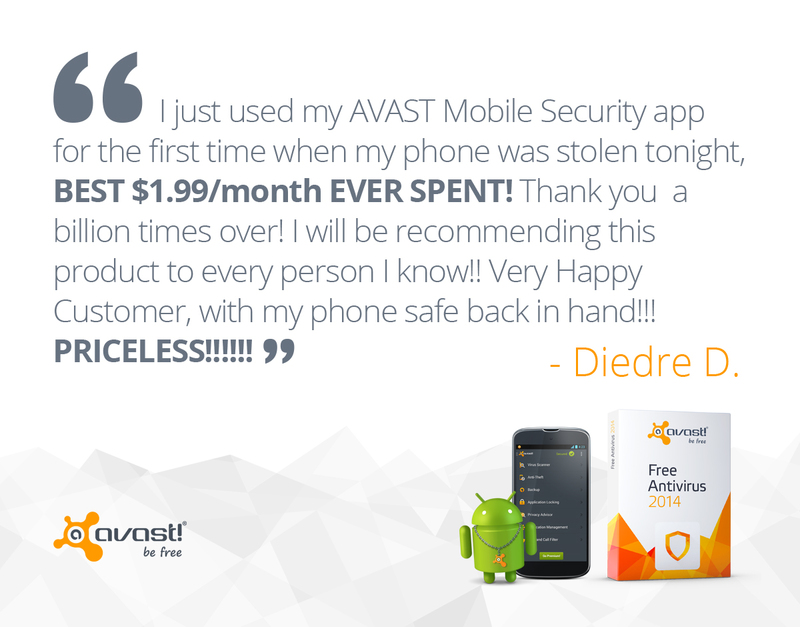 Get Avast Anti-Theft from the Google Play store!